Megyn Kelly began the episode discussing the Sutherland Springs, TX church shooting. Megyn Kelly had an emotional chat with Craig Melvin via satellite. 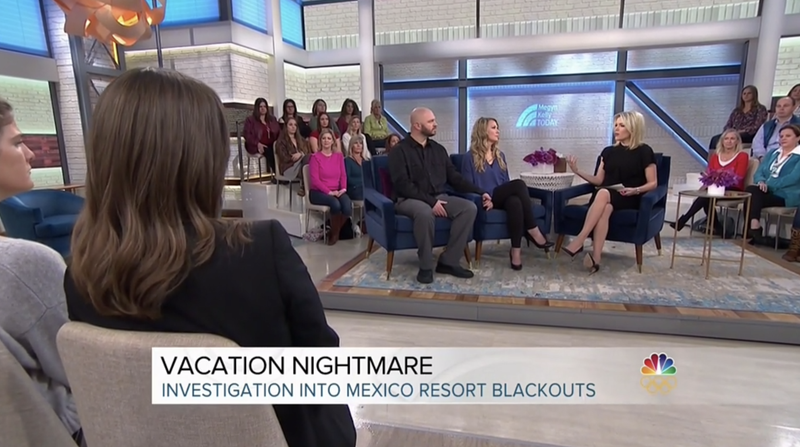 Megyn Kelly rolled tape of a couple, Heidi and Corey Sorrem, who dealt with a nightmare situation while on vacation in Mexico. Heidi and Corey Sorrem revealed they were staying at a resort in Playa Del Carmen when they blacked out after drinking suspicious shots. Heidi fell, suffered a fractured skull and brain bruising. Heidi and Corey Sorrem were welcomed to the stage. Megyn spoke to Raquel Rutledge, a Pulitzer Prize-winning investigative reporter for the Milwaukee Journal Sentinel, who has written about scenarios like this happening to several couples. Megyn Kelly asked Heidi and Corey Sorrem if they would ever go back to Mexico. Heidi Sorrem said she would not. Megyn Kelly welcomed a woman named who wrote a book called The Impossible about her son John’s “resurrection” after he fell “through an icy lake.” John was seated beside Joyce, and their pastor Jason Noble was seated beside him. Megyn Kelly asked John Smith if he remembered being in the water. John Smith said people need to “cherish every moment” with their family. Megyn Kelly thanked the Smiths and Jason Noble for coming. Bobby Finger wondered who Andy Grammer is. Megyn Kelly welcomed Andy Grammer to the stage. Megyn Kelly directed Andy Grammer to the stool on which he would be performing. Kathie Lee and Hoda said Blake Shelton, Diane Lane, and Andy Grammer would be on their show today.